Made with just 5 ingredients with one pot in just under an hour, this traditional Greek potato stew (πατάτες γιαχνί) is rustic potato perfection. 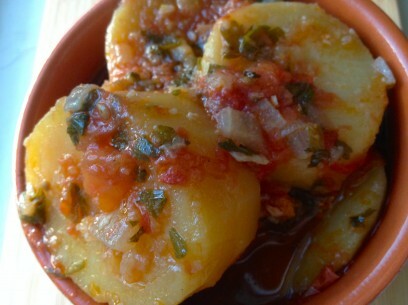 Red ripe tomatoes, fresh parsley, sweet red onions, minced garlic and yellow potatoes simmered in olive oil combine to create one of the simplest, most authentic and amazingly delicious Greek dishes you will ever enjoy! I’ve found that yellow potatoes work very well in this recipe and much better than, say, red potatoes which just seem to fall apart here. 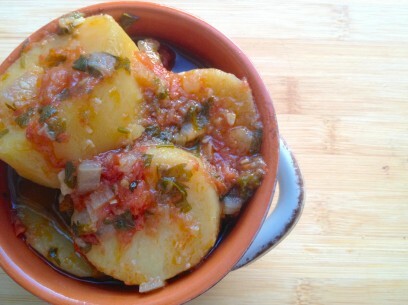 You need a heartier potato that’s able to soak up all the amazing flavors of the sauce while still remaining intact. And I recommend peeling your potatoes with this recipe. Leaving the peels on takes away from the finished dish for me but you’re welcome to keep them on if you prefer. Thick slices of potato are my favorite and really give you a meal as opposed to just a side dish, though you can certainly serve it either way- I love a side of patates yiahni with Chickpea fritters (revithokeftedes)! It’s important to remember that because there are just a few ordinary ingredients in this recipe, you need to make sure they’re the best quality. Ripe, juicy tomatoes and Greek olive oil are must haves in addition to fresh (not dried) parsley which brings such a brightness to this hearty potato dish. I use chopped fresh tomatoes because they make for a sweet and light tomato sauce but in a pinch you can use canned whole peeled tomatoes. If you do go with canned, drain off as much of the liquid as possible before chopping. 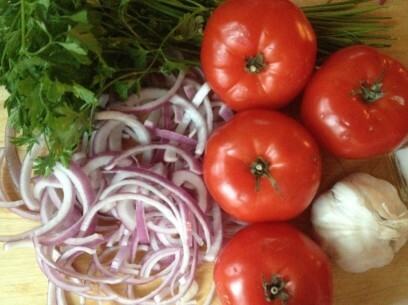 Do not go with crushed or pureed tomatoes as your sauce will be much heavier and not nearly as light as it should be. 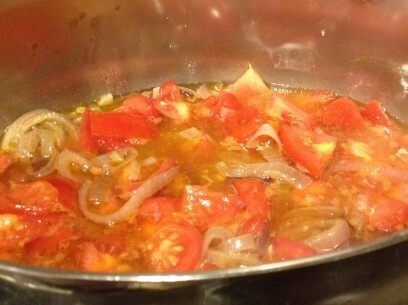 After sautéing the red onions and garlic, add the salt and pepper, tomato paste dissolved in water and chopped tomatoes. 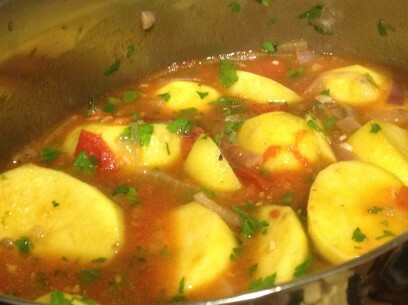 Allow the tomatoes to cook down for about 10 minutes before adding the potatoes and remaining water. Add the chopped parsley about 2 minutes before adding the potatoes to help flavor the sauce; then once you add the potatoes, they’ll just soak up every drop of the yummy goodness! 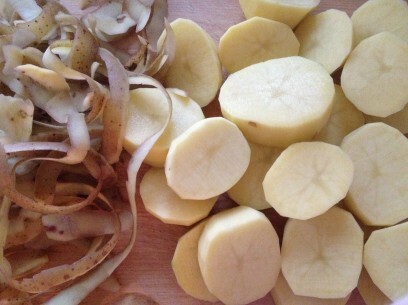 Add your thick sliced potatoes and remaining water, bring to a boil, lower to a simmer and cook uncovered for 40 minutes or until potatoes are fork tender. Make sure not to over cook as the potatoes will begin to fall apart. They’ll still be super delicious but just not as pretty so I recommend you test them at the 35 minute mark. In a larger pot (at least 6 quart size), sauté red onions in olive oil over low heat until almost soft. Add garlic and sauté another 3-4 minutes until garlic is soft, careful not to burn. Add salt, pepper, tomato paste dissolved in water and chopped tomatoes. Cook on low heat for 10 minutes, adding parsley when you get to 8 minutes or so. Tomatoes should have begun to cook down and be pretty soft at this point. Add thick slices of potato and remaining water. Bring to a boil and lower to a simmer. Cook uncovered for 40 minutes or until potatoes are fork tender. Check potatoes at 35 minutes for doneness. Allow potato stew to sit, covered, off the heat for about 15-30 minutes before serving. Enjoy from the stove or at room temperature. Oh how I miss that market!!! I need to get back to Crete.. I recently came across this website. I made this recipe today and all my carnivore family loved it. It was amazing. 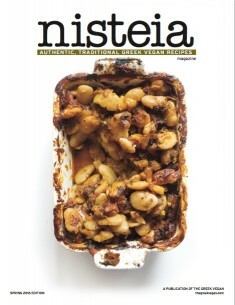 Can’t wait to try lots of other recipes on the site. This could be my favourite vegan recipe site ever. Do you have plans to make a recipe book or does a book already exist? Would love to buy it. The water didn’t cook off as I’d hoped it would, but all of the onions gave it a really sweet taste. I think some lemon juice might be a good addition. Good recipe. Are others having trouble finding Greek oregano, olive oil and sea salt? Would having other types be ok to make this …or just don’t bother? Think I will try it anyway!!! May comment on my results. Is 5 cups of water a lot? Will it cook off? I can’t wait to try this! People are mentioning fresh Greek oregano in the comment , but I am not seeing it listed in the ingredient list … Am I just missing it ? Thanks ! I did make the recipe as written ( well I cut back on the oil a little ) and it was /is delicious!! Could this be made in a crock pot? What would you recommend for timing? How many people does this recipe serve? I’m wanting to make enough to feed at least 20 people. have tried different recopies from your website and it always works out well.